I was at a church brunch recently and the ladies at my table started talking about egg casseroles. It was fun to hear everyone’s take on them…for both sides…the cooking them and the eating them. After listening contentedly for a few minutes, I chimed in with a few thoughts myself. I went on to tell them about this one dish egg casserole that I brought and why I chose the extra-sharp, how I took me what felt like 9 minutes to locate the extra-sharp cheddar cheese in the cheese department, and how I used the English muffins because it’s what I found in my freezer. I loved the balance of flavors and textures in this egg casserole. The crushed red pepper gives a hint of heat. 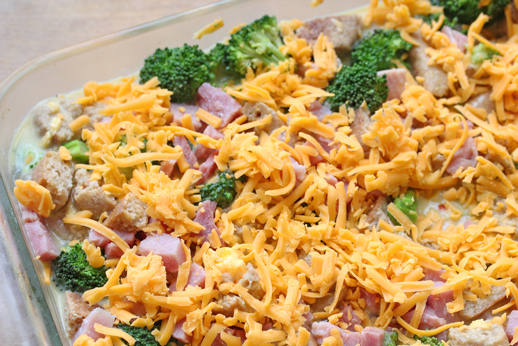 The paprika brings a bit of smoky sweetness, and the ham and broccoli work perfectly with the rich and deep flavor of the extra-sharp cheddar cheese. I hope you enjoy the rich flavor that the extra-sharp cheddar cheese brings to this one dish egg casserole! In the morning, sprinkle the remaining shredded extra-sharp cheddar cheese over top of the casserole. Bake, covered, at 375 for 45 minutes. Then remove the foil and bake for another 15 to 20 minutes, or until the casserole puffs up and slightly browns on top. Serve warm to hungry women at church brunch, or to your own hungry brood! This entry was posted in Casserole, Recipe. Bookmark the permalink. Hmm….this looks interesting. The wife does make breakfast for dinner at times, maybe she will try this. I have tried this recipe and have a few questions to the person who actually wrote it. I am noticing that all of the recipes I get from this web site are listing a time that is not long enough as they do not complete in gas ovens and need to be cooked longer. It is as if you have a convection oven. Have you given the thought that not many persons have that type of oven? The other thing I have noticed, in order for the recipes to fully cook they need to be moved from the mid rack of the oven to the bottom rack. Keep in mind, I have a husband who used to be a prep cook. Grant it, all of the ingredients are wonderful and everything has turned out great but it is the cooking times that have come into question. I would greatly appreciate some answers on this matter as I honestly am starting to raise a slight question when reviewing your recipes. I hope to hear a response from you in the near future on this matter so I can continue to enjoy your posting of recipes. Thank you. I do use an electric oven. I haven’t done much research and have not experimented with different kinds of ovens…I used to have a very unreliable gas stove when I lived in the Dominican Republic, but it’s been electric ever since. Maybe someone else with more experience cooking with both can shed some light!? It is kind of funny that I stumbled across this today! I have recently bought a new stove, convection oven! My old electric stove always ran way too hot, no matter how much I played around with the cooking temp. and time. Things were usually cooked on the outside and not on the inside. With the new stove, whether I use the convection option or the regular convential, I find that the cooking always takes longer. Having talked to just about everybody I know, the salespeople and trying to find answers on the web I have learnt that depending on the type of stove, whether you have hidden elements, if it is gas or propane, regular electic, etc. all stoves will cook differently. Meaning that the temperature guage can and will vary from make, model and even just stoves. Because of my disappointment with having a new stove that I didn’t think was cooking properly and having a stove that actually wasn’t cooking properly ;o) I have read that you should invest in an oven thermometer and verify the oven temperature with the oven thermometer and learn how your stove works because of the differences in most stoves. I am learning with my new stove that I do have to cook things a little longer, now that I know that it is getting easier! On another note, I saw you today on The View (I think it may have been a repeat seeing as it is Thanksgiving) and loved your segment. Keep cooking and keep saving! Just a thought, I would adjust the cooking time according to your oven. This looks so easy to make & yummy,too! Humm….12 eggs seems excessive. I am hoping you meant 1 – 2 eggs. Nope, 12 eggs. That’s how much it takes to fill up the casserole. Much of the egg-milk mixture gets soaked up by the English muffins. If you want a hardy, filling egg casserole, you’ll need 8-12 eggs, depending on the dish size. Now that I think about it, when you say 12 eggs and the filling of the casserole dish that is required, it actually makes sense. It took me awhile to determine the reasoning but after reading your response I can understand why. Now that I know, I actually do have the right size of casserole dish that is perfect for this one dish meal. Hey Erin!! I won your cookbooks over on VivoBello’s Blog! I just wanted to let you know that I got the first one today, and paging through it, I can already tell you that I LOVE IT!!! I am really excited for the second book to arrive too! 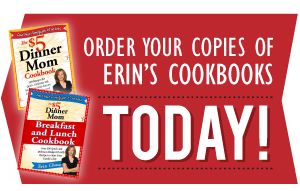 There are not many cookbooks that I say I “love” because I’m allergic to a lot of food, and so a lot of the recipes because unusable in our house, but there are tons that I already came across that I know we’re going to try out!! Super excited and going to try some out this weekend!! I’ll let you know, because I’m sure there will be some blog entries about it and I’ll be linking you up for them!! Thanks!! This looks perfect for a birthday brunch I’m throwing soon. Thanks! This looks amazing. I think I am going to try it with some marble rye bread. YUM!!! I wonder how this would do in the crock pot over night on low. It would be wonderful to wake up to this already cooked. I’ll have to try it and let you know!!!! I wonder if this could be made with egg substitute. It looks good but too much fat in all those eggs. No need to buy an oven thermometer. Try this from Cook’s Illustrated Members Only. You can use either a digital thermometer or just a plain candy thermometer will work. Put an oven rack in the middle of the oven. Heat the oven to 350 degrees Fahrenheit for at least a half hour. Put a half cup of 70 degree tap water in your 2 cup Pyrex measuring cup (you can fuss with it by adding hot or cold water to adjust the temp â€“ itâ€™s important that it be at 70 degrees to start with). Place the measuring cup in the oven and close the door. After 15 minutes, take the measuring cup out of the oven and take the waterâ€™s temperature with your thermometer. Swirl the water around to make sure the temperature is even. The thermometer should read 150 degrees Fahrenheit. OOPS…Correction on above post re: checking your oven temp without an oven thermometer…. “put one cup of water in the measuring cup” Not “a half cup”. How many is this recipe supposed to be for? Is it possible to halve it? And use 6 eggs? Yes, you can definitely half the recipe and put it into an 8×8 glass baking dish. Enjoy! Does it have to sit overnight? It can sit overnight Heather, but doesn’t have to! Enjoy! Made this today for the LDS missionaries and my roommates. It was a hit! The broccoli in it really brought out a lot of flavor and that was probably the best part! I fell asleep when it was cooking so it did cook longer than advised which made it more firm, in the sense that it held together well. Definitely doing it again! Awesome…so glad y’all enjoyed it! I made this for a group this weekend…..it was delicious!!! I cooked it as directed and it came out perfectly!! Everyone raved about it!! Awesome Wendy…thanks for coming back to let us know it was a hit! We especially love the extra-sharp cheddar flavor! Can I make this” early in the morning” the day before and refrigerate until I bake it the next morning? Absolutely Erlene…I’d let it soak for at least 2 hours before baking it. Hope you enjoy it! Thank for your response Erin. “Iâ€™d let it soak for at least 2 hours before baking it. Breakfast casseroles are best made by letting the bread and egg mixture soak for a few hours. So once you’ve assembled the casserole, cover it with foil and then let it sit in the fridge for a few hours to allow the egg and milk mixture soak into the bread. Then it will bake up perfectly. 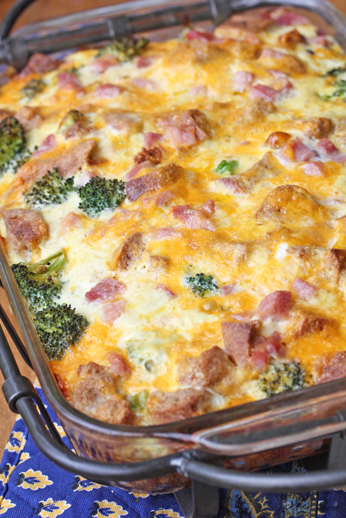 Most breakfast egg casseroles say to soak over night or for at least 2 hours. Hope that helps! Thank you so much for your help, Erin. Iâ€™ve never made a breakfast casserole before and I am having guests visit for a 2 day stay and I would like to do as much as possible before they arrive. So if I prepare the casserole the morning before Iâ€™m going to serve it, it could be in the fridge for about 20 hours or so. Would this be too long for it to be refrigerated? I don’t think I was too clear in my previous message. Say if I prepare the casserole on a Wednesday morning, refrigerate it until Thursday morning and bake it then. Do you toast the english muffins first? I don’t like to freeze cooked egg casseroles and I wouldn’t recommend freezing it before cooking either. You can put it together up to 24 hours before baking it, if you want to leave it in the fridge for that time. This might be a dumb question but, when you say “Four English Muffins” do you mean four individual slices of English muffins (two pairs) or four pairs of English muffins? Does that make sense? I’m excited to try put this together tonight for company tomorrow! I plan on splitting the recipe in half and cooking in an 8×8. I have a gas oven. How long should I cook out for? I’ve never made an egg casserole before! The dish sounds great, but here in Australia the eggs and cheese alone would cost more than $12. Envious of the cheap food in the US. DONT EVER, NEVER, ANY TIME what so ever put a glass, or pyrex casserole from the refrigerator to the hot oven. There is what we call thermal shock that will or could shatter the dish. The dish must be at room temperature or warmer to prevent thermal shock. the recipes sounds great. I will try just after Easter we have extra ham. I would like to make this without the English muffins. Do I need to adjust the amount of milk? can I do this in a crock pot? This casserole was a big hit! I used 6 slices of store bought gluten free bread instead of English muffins (not toasted) and used a cup of Lactaid in place of regular milk. It had a nice taste and great texture. To download the free program Brawl Stars get iTunes.